108-7-3 Reference about the emblem "TRI"
On the national flag of Isle of Man, the emblem of Triskele is decorated in the middle of red field. Triskele, in other words, it is regarded as one of the traditional patterns seen worldwide. Those which are roughly divided into three designs combined with a spiral, and three foot bent at right angles are combined with a windmill shape centered on the base of the leg at an angle of 120 degrees. It is said that it is tripod morphology in Japanese. However, there is a definition that these three legs are rotationally symmetric figures three times symmetrical. Triskele is also called worldwide by different names such as triskelion (τρισκελιον), triskele (τρισκεληϖ), Triple spiral. It can be said that the triple-leg design called Triskele belongs to the emblem which is called Tomoe in Japan. This crest called the mag−tama is a traditional Japanese pattern with a design similar to paisley. Although it is used as a crest, it is used as a god crest or a temple crest is Japan. This pattern is drawn on the drum used at the festival. It is a relatively familiar crest seen from childhood; it can be called design in japan. In addition, since this crest is used for roof tiles etc., it seems that you know if you are interested in Japanese houses. There is also a time when interpretation is made that the crest of the combined with a spiral is drawn by water, which means that it is a pattern related to water. Since the Heian period of a thousand years ago was also a time suffering from a big fire, it seems that the buildings in the late Heian era began to be decorated with roof tiles. It seems that this was started by aiming at the effect of magic to protect the house from fire, by carving water crests, but it seems that Tomoe began spreading as one lucky charm. 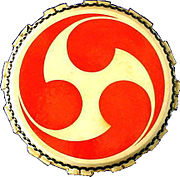 Afterwards, the design of the spiral of the combination (Tomoe-mon) was adopted by crest of the god of Yahata and Yahata Shrine , the god of battle. This god was very popular in Japan, so it is said that other shrines also began using the spiral of the combination with the spiral design of as a god crests. Yawata God is a god that gained popularity as an alias archery Hachiman. There is a deep meaning to Tripod (Tomoe) that adopted as a god crest. The samurai is similar in design to , the form of a leather wrapper (also / like a supporter) wound in a bow hand (left hand / hand with a bow ) and a Paisley known for three kinds of sacred treasure It is said that this this gained popularity as a symbol of God. Furthermore, the tripod depicted in the big drum was considered to be thunder. It is said that it is regarded as the direction in which the lightning blows (the outer circle) = lightning blows up as the roaring sound generated by hitting the center hit point called the head is flying. These are the design definitions of the pattern of the Isle of Man called Triskele and the pattern of Japan called mitsu-domoe. Round roof tile seen in Japanese architecture is a round tile used for roof eaves, but it is also called Stirrup tile (abumi-gawara) because its shape is similar to the shape of Stirrup (abumi). The roof tiles are often engraved with lotus flower patterns and tripod, and it seems that the eaves of the engraved tiles that are with the crests are called tripod legs tiles. It is said that the shape is said to be in the shape of Stirrup, because the armor Stirrup (yorroi Abumi) used by Sengoku Commanders and the like and round roof tiles (nokimaru-gawara) are similar. However, the shape is not similar to what is widely called stirrup in the world. By the way, “Abumi” is one of the harness used for horse riding. In English it is called Stirrup. Abumi is a thing that hangs one pair of right and left from the saddle placed on the horse's back with Abumi Leather And puts his feet on the horse. Also, it is said to wear Stirrup (abumi), but it is an indispensable tool for horse riding which plays a role like a step of a motorcycle when running. Personally, is Stirrup (agitator) and Round roof tile (Noki-maru- gawara) similar? I do not know, but there used to be similar designs in the past. However, these ideas and interpretations sometimes change depending on the times. Although there was also an explanation that there was also a time when that the pattern is interpretation that water is rolled up, there are also three patterns of whirlpools in the pattern of Celt. This is a pattern called Irish Triskele (τρισκεληϖ) in Ireland. This swirl pattern is said to be a sacred symbol used by ancient Celtic people, but in Ireland this pattern is also used for decorative items, goods, goods packages and so on. In the first place, since this pattern is engraved on the ancient ruins, it is no doubt that the Celts in ancient times made buildings with some meaning in this pattern.That's why it's not all specifically clarified. However, it is certain that this pattern has become familiar and loved from ancient times to the present. Also, in Ireland, it is said that it is often arranged in the direction and position where this sun hits, and it is said that it is said that in a passage, it symbolizes solar energy. It surely looks like a solar flare. And this Triskele is said to be a symbol of growth and evolution, it is also said to be a symbol of resurrection. Speaking of Isle of Man, I think many people think image of TT-RACE, but one of the legend and top Joey Dunlop is from Ireland. THE KING OF THE ROAD and honorable Dunlop sticks to the number 3, even if he was a champion, he liked number 3. It may be because Celts believed that there was special power in the number 3. Strictly speaking, it would be better to say that it was believed by ancient Celts, but that would be inherited to the present age. And this Triskele also has three spirals. Triskele is a symbol of the Trinity goddess in Celt and is considered to be very sacred. Moreover, Triskele and Triquetra are written in Celtic Christianity as a trinity symbol in the manuscript of the scripture, and this manuscript is preserved as a national treasure carefully. The Celtic three major decorative manuscripts "The Book of Kells", "The Book of Darrow" and "Lindisfarne Gospel" are scattered with Triskele and Triquetra patterns, which is said to be the most beautiful book in the world. Is the pattern called Triquetra here common with Triskele? I do not know which the original is, but in both cases the number 3 is involved as well as triskele and crest patterns. 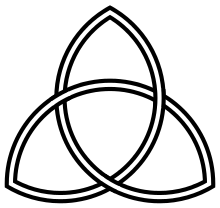 Triquetra is also called Celtic Trinity knot, it is a pattern that Celtic people prefer from ancient times. Why those Triquetra do was preferred by Celts from ancient times? It is because this Triquetra pattern is engraved on the excavated in the wide area. It seems that these Triquetra are also drawn on ornaments and ruins that are supposed to be used for the druid religious ceremony which is said to be a priest of Celt. However, since it is a Celtic culture of Oral expression culture that does not have a culture of letters, there are no meanings in these patterns, and there are no books or documents like those used in such intention. Therefore, please understand that these are talks based on legends and guesses. Also, due to various research and interpretation by researchers, we cannot deny the possibility of having various meanings later. In addition, are the patterns such as Triskel and Trichetra the original of the ancient Celtic person? There seems to be a theory that it is not certain whether it began to be used by St. Patrick to convert the Celts to Christianity. For these reasons, some researchers say that they cannot affirm that these are definitely and reliably ancient Celtic objects. Regardless of the truth, since most of the recognition is that these patterns are Celtic, I would like to proceed with the assumption that this is Celtic as it is. This basic form of Tricetra. There is an ancient Japanese pattern very similar to a pattern called Trinity Knot (3 knots). Its name is also a Japanese pattern called Kashiwa (Musubi-Mutsu-Kashiwa / Three connected ties Three Oak Leaf) that is tied. Neither is it that the three patterns are not stuck together, it is said that it is a pattern drawn with a single line. Japan's unique closely crest Japanese pattern called Musubi-Mutsu-Kashiwa / Three connected ties Three Oak Leaf , but how does it feel when viewed worldwide? There are many similar patterns in the world. 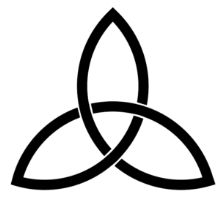 Trinity knot (three knots) has meaning such as heart, body, soul (spirit), life, death, regeneration, etc. It is told that these are the patterns expressing order that they are neutralized and keep balance it is said that it was also used as a symbol of ideas and concepts such as death of ancient Celts who worship nature ~ to reincarnation. 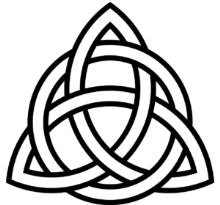 Tricetra is also called Celtic Trinity Knot (Celtic Three Knots) or simply Trinity Knot (3 Knots), which means "three corners" in Latin. By combining circles, the concept of eternity has been added, emphasizing the combination of the three powers more. In Christianity it is used as a symbol of the Trinity (Father, Son, Holy Spirit), so it seems that there are many people who have seen it. So, there are many other designs that closely resemble Celtic and Japan like Trinity Knot and Three connected ties Three Oak Leaf? The answer is NO as far as I looked up. Think of similar things, do similar things, but at the same time they will make the reality that all the differences in the essence you put in there will not be the same. Also, Celts believed that there was a special power in the number 3, but also number 3 has a history that has been regarded as good figures for Japanese people. As it is reflected, a lot of 3 are incorporated in Japanese patterns and family crests. Even within the range enumerated roughly, Japan has a coat of arms that is related to this many 3 and is committed. It is thought that there are still many similarities still more if you search for common points of symbols, common points of attention to numbers. There is a theory that ancient Celts are central Asians who moved to the west and west with a wheeled vehicle. No, there is a theory that it is Indian. However, even if either of them or both are different, is not it impossible to throw away the possibility that the ancient Celtic people headed to the east? If there was an ancient Celtic who headed east to east, is it impossible to throw away the possibility that one group or faction have been to Japan? Here, just introducing the similarities between Isle of Man, Japan, Celtic, and Japan for reference only, we have not done any era verification, so please refer as one of the possibilities, fancy dream stories Please.